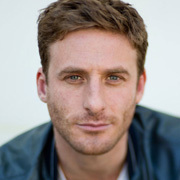 Dean O’Gorman began acting at the age of 12, after being discovered by a casting agent at a school speech contest. His screen career really got into gear in 1995 when he took centre stage in teen romance Bonjour Timothy. O’Gorman’s performance in the title role saw him nominated for best actor awards in NZ and Giffoni, the largest children’s film festival in Europe. For the next five years a glut of screen roles meant O’Gorman’s plans to study graphic design never became reality. A year after bidding bonjour to Timothy (a hoped-for sequel never eventuated) he was playing nurse Harry Martin in Shortland Street. He had sizable roles in a series of TV movies: hero Jim Hawkins in Return to Treasure Island, narrating Australian-shot apocalyptic tale Doom Runners, and co-starring in stuntman down-under story, Fearless. There was also a supporting role as a suspect in third Lawless tele-movie Beyond Justice (O’Gorman features in the second clip). O’Gorman had appeared in an early episode of Hercules: The Legendary Journeys (debuting in ‘The Gauntlet’, the second episode to feature Xena). O’Gorman later returned to play a younger version of Hercules’ sidekick Iolaus. When spin-off show Young Hercules began filming down under, O’Gorman was now co-starring as Iolaus opposite Hercules Ryan Gosling (Lars and the Real Girl). The show proved shortlived, partly due to changing directives from American network executives. A month after the final episode of Young Hercules aired in America, O’Gorman’s second feature film debuted. When Love Comes was an ensemble tale in which two generations of characters tried to sort their romantic and creative lives; O’Gorman’s character was the “tortured wastrel” (Russell Baillie) in the romantic sights of Simon Prast’s character. O’Gorman took the role partly out of an urge to find a challenge, and avoid typecasting. When Love Comes won some good notices upon American release, but little attention at home. O’Gorman’s third feature made more local ripples. The stylish Snakeskin saw him co-starring as one of two small town dreamers who hit the road in a Chrysler Valiant; O’Gorman’s character has a soft-spot for his longtime friend (Melanie Lynskey from Heavenly Creatures), but things go awry after the duo encounter an American cowboy who may not be the charmer he seems. “It was tough, but beautiful at the same time,” said O’Gorman of the shoot. “Driving the car was like moments of pure freedom, surrounded by nature rather than stuck in a studio. But it was cold.” Reviews were upbeat, and Snakeskin took away five gongs at the 2001 NZ Film and TV Awards, including best film. O’Gorman scored an even bigger role in Harry Sinclair’s third feature Toy Love (2002). This time he co-starred as Ben, a young charmer who lies and cheats his way through relationships, then meets his match after falling for the even more immoral Chlo (Kate Elliott). Though a box office disappointment, the film won the Audience Jury Award at the Fantasporto festival in Portugal. Since Toy Love O’Gorman has worked on both sides of the Tasman. His Australian roles include time on the cast of hit show McLeod’s Daughters, and voice-work for animated series Animalia (based on the bestselling book). Perhaps channelling his time on Shortland Street, O’Gorman was nominated for a best supporting actor award for soap satire Serial Killers, created by ex-Shortland scribe James Griffin. This time he played a soap actor who tries to charm the writing team into killing his character off, in the belief it will make his character more popular (see the clips for episodes four and five). Fresh from a role on don't dream it, be it drama Go Girls, O’Gorman got another award-nominated role, this time in 2010's Nights in the Gardens of Spain. Based on the Witi Ihimaera novel, the tele-movie saw him playing lover to the main character, a man who seeks more recognition in his partner’s life. He also acted in Tangiwai (as champion test cricketer Bert Sutcliffe) and co-starred in low-budget Los Angeles feature Sabotage, playing a rookie detective investigating a run of murdered musicians. Then came an ongoing role that surely won him new fans: as PR man, charmer and part-time god Anders Johnson, over three seasons of the quirky The Almighty Johnsons. Part drama, part comedy and part fantasy, the show was the brainchild of Outrageous Fortune creators James Griffin and Rachel Lang). In April 2011, Peter Jackson announced on his Facebook page that O'Gorman was to join the cast of The Hobbit, taking over the role of dwarf Fili. The trilogy of films marks O'Gorman's most widely-seen role to date. In 2015 he was cast in mini-series Hillary, which covers the life of Sir Edmund Hillary. After a run of nominations, O'Gorman finally won his first local Television Award for playing Hillary's lifelong friend, adventurer George Lowe. American drama Trumbo was released in the same period: this time O'Gorman played actor Kirk Douglas. The film stars Bryan Cranston as screenwriter Dalton Trumbo, who was blacklisted in Hollywood during the 1940s after accusations he was a communist. In preparation for his role, O'Gorman wrote to the 98-year-old Kirk Douglas asking advice, to which he responded "Playing Kirk Douglas, forget him ... just play the part and you will be fine." O'Gorman went on to co-star as Jon in Matt Murphy's Pork Pie. The film was a remake of Geoff Murphy's classic Goodbye Pork Pie, with O'Gorman's character an updated version of Tony Barry's struggling writer from the original.